Ladies ZARA Leopard Print Blazer/Jacket - Size L (UK 12-14) - Ex Cond! 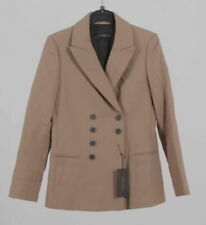 Ladies blazer/jacket by Zara. Size L (UK 12-14). Leopard print fabric with single button fastening. In excellent condition. Grab yourself a bargain! Jacket worn but still in good condition. The colour is grey. 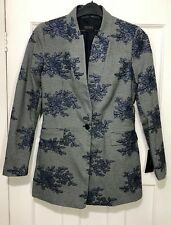 Stunning 'ZARA WOMEN' Blazer Style Waterfall Jacket Size S. Condition is Used. Gorgeous edge to edge, waterfall style smart/casual jacket with decorative zip detail to the front. Please look at all photos as i have tried to include as much detail as possible. Thank you for looking and if you require any additional information, please feel free to contact me before bidding as i do not accept returns. Ladies White And Navy Stripped Jacket. Condition is Used. Dispatched with eBay delivery – Shutl 1 day. 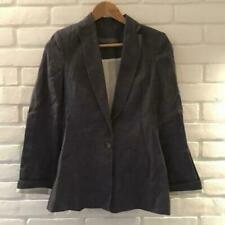 Zara Basic Navy Blue Blazer. Lovely navy blue fitted blazer, fully lined with attractive white/blue pinstripe lining. With 2 waist pockets this is a smart, versatile little jacket. Length from shoulder to bottom hem is 63cm. In great used condition. Four buttons at the cuffs. Smart jacket as is, for work or casual. This jacket is in good gently used condition. One shoulder has got a slight rippling to the fabric possibly caused by ironing or steaming with heat. See pictures. Still looks great on. Length- 60cm. This cream textured jacket by Zara is perfect for special occasions and formal events. It has a classic collar, an allover textured pattern, double breasted buttons and front pockets. Treat yourself! USUAL ZARA DETAIL LINING AND BUTTONS. QUALITY MATERIAL NOT FINE OR THIN, NICE BEIGE COLOUR IMMACULATE CONDITION. Zara Silver Grey Metallic Thread Boyfriend Blazer Jacket I customised the jacket myself with the velvet bow tie. Unique. Size Medium 10 12 . fully lined. Intact. great condition. could benefit from a clean as straight from my wardrobe. I’m having a massive bargain clear out to raise holiday cash. Combine shipping. Condition is Used. Dispatched with eBay delivery – Shutl 1 day. Lovely blazer by Zara Basic. This is not visible when wearing the blazer and does not affect its wearability. 55cm / 21.5" center back length without collar. Can be collected from Leeds, LS12. New listingZARA TWEED CHECKED FRAYED LONG JACKET BLAZER FROCK COAT, SIZE M - UK 12. ZARA TWEED CHECKED FRAYED LONG JACKET BLAZER FROCK COAT, SIZE M - UK 12.. Dispatched with Royal Mail 2nd Class. New listingZARA TWEED BLACK FRAYED LONG JACKET BLAZER FROCK COAT, SIZE L - UK 12/14. ZARA TWEED BLACK FRAYED LONG JACKET BLAZER FROCK COAT, SIZE L - UK 12/14.. Dispatched with Royal Mail 2nd Class. 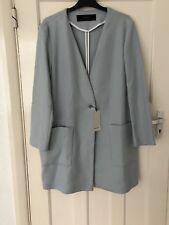 ZARA Women's Blazer Jacket Size S.
Brand New Zara Basic Blue with Silver Thread Tweed Blazer With Pearls Size M. Condition is Used. Dispatched with eBay delivery – Shutl 1 day. zara jacket medium. Condition is Used. Dispatched with eBay delivery – Shutl 1 day. ZARA LADIES WOMAN ANIMAL PRINT PARTY EVENING BLAZER JACKET SIZE XS. Great used condition. Pit is 17" back to hem 25" top of arm to cuffs 24". Cotton poly blend. 2 stitched pockets. 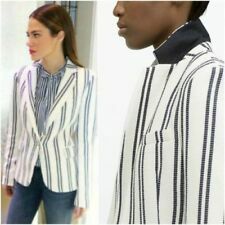 Very unusual nautical inspired fitted blazer from ZARA woman Size M = UK 10. Gentle diamond quilt main with contrast beige detailing. contrasting top stitch across blazer. two flap hand pockets. stand-up collar and turn back cuffs. 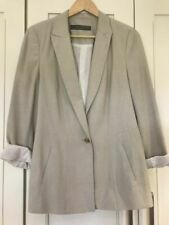 Zara NEW GREY LINEN TUXEDO BLAZER GATHERED SLEEVES COAT SIZE M. Long flowing blazer featuring a lapel collar, pleated sleeves and front flap pockets..
Zara Basic Black Jacket, Size L. Condition is Used. Dispatched with eBay delivery – Shutl 1 day. Zara Check Blazer Size S Used once. Immaculate condition. Used practically new blazer. Size Small oversize fit. **ZARA Brown Tartan Jacket, Size S, Used but Perfect Condition**. Condition is Used. Dispatched with eBay delivery – Shutl 1 day. Great blazer in VGC. 24" /61cm long. 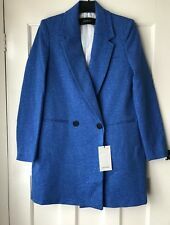 ZARA Contrast Jacquard Stitch Boucle Tweed Jacket Turquoise Blue. Size Medium. ZARA - Stunning Turquoise Jacquard Boucle Tweed Jacket. Length - from nape to hem 22”/ 57cm approx. Lovely button detail. Width - from underarm to underarm 19”/ 48cm approx. LOVELY LITTLE JACKET FROM ZARA. PRETTY SOFT SHADE OF PALE GREEN. VERY EASY TO WEAR FOR ANY OCCASION - CASUAL WITH JEANS OR AS SHOWN IN THE PICS OVER A FORMAL WORK DRESS -- VERY PRETTY ON.